Fashola, Okadas Riders Need State Protection Too! An unidentified okada man believed to have contravened the new Lagos State Traffic Law was today, shot dead by security operatives in the Ilupeju area of Lagos State. The law prescribes punishment for traffic offences, and does not give security forces license to kill offenders. 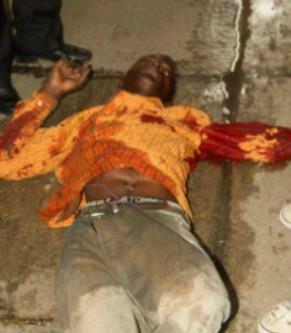 Just a few days ago, an okada man was stripped naked by law enforcement agents. Is this what the new traffic law is about? Like other citizens, okada riders also deserve the protection of the state authorities from such needless attacks and killings. Please keep sharing, tweeting this story until it gets to the attention of the Lagos State governor, Babatunde Raji Fashola. Nigerians have had enough of these senseless killings!! !